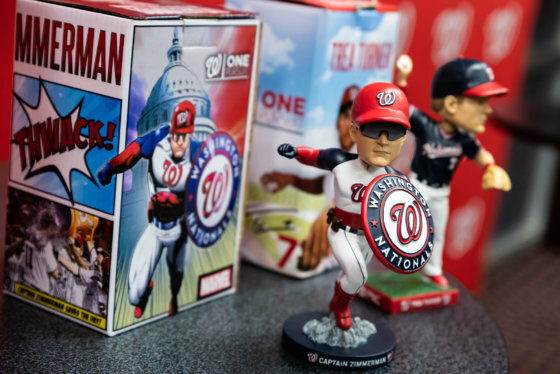 The Washington Nationals 2019 season includes expanded efforts of local philanthropy and community engagement. Some kids on baseball and softball teams lacking big ticket sponsors for uniforms might feel self-conscious playing against teams in fancier duds. But, this year, 24 leagues in D.C. and Northern Virginia will be getting 18,000 jerseys and caps donated by the Washington Nationals. 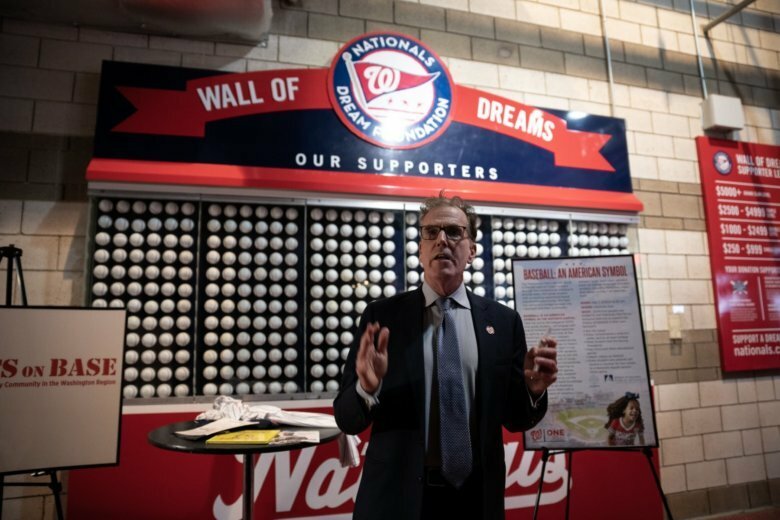 “We saved the youth leagues $440,000 this year in uniform costs, which they were allowed to turn back in and put into programs,” said Gregory McCarthy, senior vice president of the Nationals’ community engagement. From uniforms to a day at the ballpark for every District first grader and more openings in the free summer baseball program, the Washington Nationals 2019 season includes expanded efforts of local philanthropy and community engagement. Nationals Park is making some changes ahead of this year’s season. There will be new vendors, new foods and even a new brand of alcohol served in the park, but there will also be some rule changes this year. Find out what’s new in 2019. 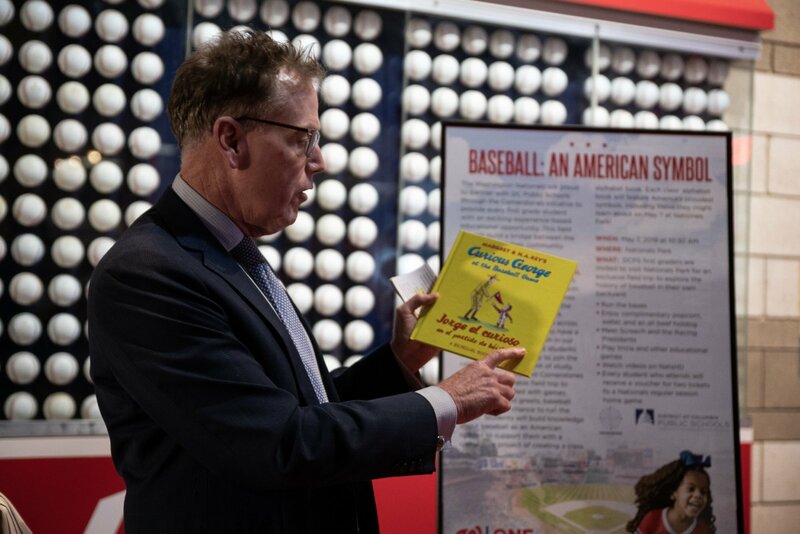 This season, along with the District, Arlington County will be a full participant in the Nats’ summer reading program — and, it will be bilingual. “We’re thrilled with that. The booklets will be in English and Spanish,” McCarthy said. On June 15 at the Arlington Public Library, Nats outfielder Juan Soto will read “Curious George at The Baseball Game,” but in Spanish (so, “Jorge el curioso en el partido de béisbol”). He’ll be joined by another player, to be named later, who will read the parts that are in English. The Washington Nationals Youth Baseball Academy, where Nats player Anthony Rendon is a board member, is also expanding its YBA Play free summer baseball program. “We had 800 children participate in YBA Play last year in Wards 7, 5 and 6. We’ll have a new site in Ward 8 this year,” said Tal Alter, CEO of the Washington Nationals Dream Foundation and Youth Baseball Academy. “The plan is to have more than 1,000 children in YBA Play participating this year,” Alter added. Hank’s Oyster Bar: Patrick Corbin’s “Smoking Southpaw,” for Capital Area Food Bank. Mi Vida: Adam Eaton’s “The Spanky,” for The Dragonfly Foundation. Whiskey Charlie: Max Scherzer’s “Mad Max,” for the Humane Rescue Alliance. The Salt Line: Ryan Zimmerman’s “ZiMS Cup,” for the ziMS Foundation. The player whose cocktail receives the most votes in the form of drinks sold will receive $5,000 for the charity of his choice.